NASA's Cassini spacecraft captured this photo of Saturn's north polar vortex and hexagon on April 25, 2017, when the probe was about 274,000 miles (441,000 kilometers) from the ringed planet. 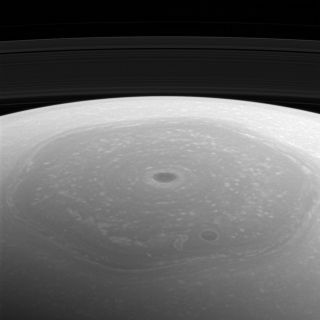 NASA's Cassini spacecraft has given us another great look at the odd hexagon and vortex that swirl around Saturn's north pole. The vortex sits at the middle of this sharp-cornered structure, giving Saturn's north polar region the appearance of an enormous, unblinking eye. Cassini snapped the newly released image on April 25, when the probe was about 274,000 miles (441,000 km) from Saturn. The image scale is 16 miles (26 km) per pixel, NASA officials said. A day later, on April 26, Cassini began a series of daring dives between Saturn's cloud tops and the planet's innermost rings. This "Grand Finale" phase ended on Sept. 15, when Cassini plunged intentionally into Saturn's thick atmosphere, ending the spacecraft's long and accomplished mission. That mission — a collaboration involving NASA, the European Space Agency and the Italian Space Agency — began with Cassini's launch in October 1997. The orbiter reached Saturn on June 30, 2004, and it delivered a lander called Huygens to the surface of the ringed planet's largest moon, Titan, in January 2005.